Earn 30 Gold Points in My Nintendo! 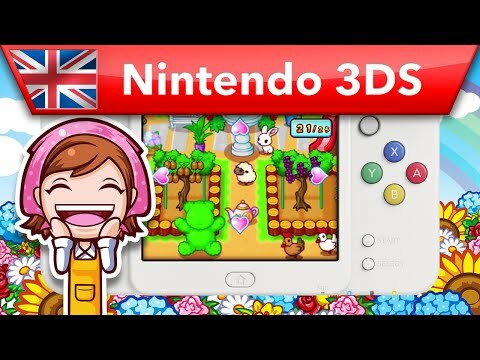 In Gardening Mama: Forest Friends on Nintendo 3DS and 2DS, wield your gardening tools with your Nintendo 3DS stylus and grow more than 50 different plants in the garden of your dreams. Together with Mama, turn an empty piece of land into a garden brimming with fresh and healthy produce, completing fun minigames while planning your garden strategy and delivering your crops to six different shops owned by your animal friends. Expand your garden by earning rewards such as new varieties of seeds, flower bulbs and trees, so you can help your friends grow their businesses by selling specific crops to keep their customers coming back for more. As each of the shops rises in rank, you can earn shopping tickets that can be spent on one of over 100 items to decorate your garden, such as fences, fountains and even pets. So to help your woodland friends and create your perfect garden in the process, make sure to plan ahead when choosing the best crops for success! Exclusive items for your garden will also be made available via SpotPass after launch, so keep an eye out for further fun customisation ideas.